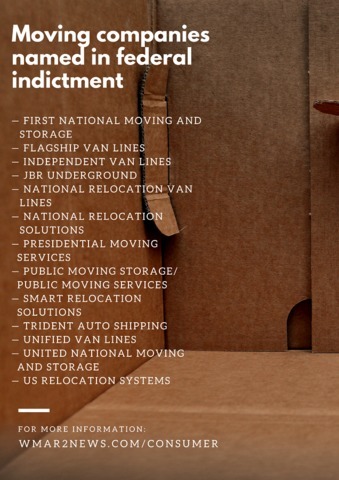 A month after the federal government busted more than a dozen moving companies for allegedly ripping off hundreds, potentially thousands of people, the victims of the nationwide scam still don't have any answers as to when they will get their belongings back. U.S. Attorney for the Southern District of Ohio Benjamin Glassman announced the sweeping indictment on July 31. Twelve people were charged with defrauding customers who hired the moving companies to move their household goods. "We’ve obtained a restraining order to lock down seven warehouses throughout the country that were used by this enterprise including one in West Chester, Ohio," said Glassman during the news conference in July. Michael Casari and Gail Lucas learned that's where Flagship Van Lines took all of their items after they picked up their things on June 13. And the morning of the indictment, they received the call they had been waiting for. "They don't have our money and the FBI has our stuff so we’re good to go, I feel lucky," said Casari and Lucas. However, a month later, they're feeling a little less optimistic. "We get very little communication, we try to keep communication going with the departments handling these things and we get little to no responses back," said Lucas. WMAR-2 News has learned the hold up is due to legal proceedings. "The latest that we heard was that Mr. Shuklin, Andrey Shuklin, he was the head of the snake that set-up all these multiple sham companies, he's being extradited from Florida to Cincinnati and that they're waiting to take him before a judge to give permission for the victims to get their property," said Casari. The victims haven't been told when or if that will happen. Some don't even know if the government has their things. And Casari and Lucas, who have become a sort of liaison for many of the victims, are pressing for answers. "I wrote a letter that made me cry because I was so depressed. I've since recovered a bit, and I got a six or eight-word response, 'when I hear something from the DOJ, the attorney's, I'll let you know.' Boom. That's it," Casari said. Silence and no resolution. It's a situation all the victims of the moving companies are too familiar with. "Can you imagine if everything you owned was gone? And you knew where it was but you couldn't get it because of the red tape?" asked Casari. </p><p>If there's any good out of this, Lucas and Casari said it's that the victims have come together to support each other. They recently helped a Tampa man who tracked down his items to a storage unit in California. “He flew here, rented a truck, we helped him load it, picked his dad up at the airport, his 70 something-year-old dad at the airport, and drove back across the country together with their belongings,” said Lucas. Others have been able to contact the driver who moved their items and he's told them where their stuff is. And some have even agreed to pay movers who they knew were illegally transporting their items. WMAR-2 News Mallory Sofastaii also spoke with an ICU doctor whose medical credentials are being stored in the West Chester, Ohio warehouse. He can’t practice medicine and is at risk of losing his new job if he can’t get into the warehouse soon. WMAR-2 News reached out to the U.S. Attorney’s Office of the Southern District of Ohio but did not immediately hear back. The U.S. Department of Transportation Office of the Inspector General chose not to address our questions.